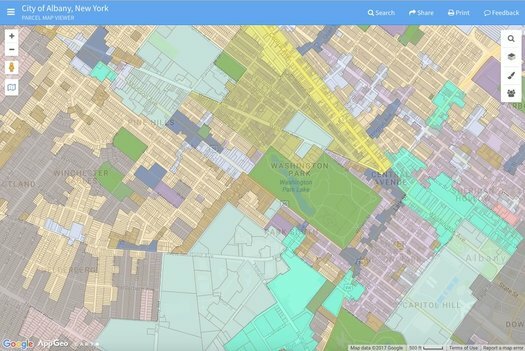 The city's new zoning map as displayed through Search Albany. 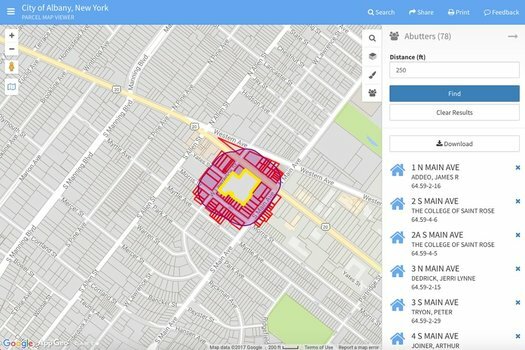 The city of Albany unveiled a new online tool -- called Search Albany -- for accessing all sorts of info related to properties around the city Tuesday. It's basically a map through which you can access details about individual properties -- such as the name of the owner -- as well as neighborhood-level info such as zoning districts and Common Council wards. The best way to get a feel for it is to just play around with it, so go for it. For example: You can search properties by owner, so it's possible to look up all the properties in the city owned by the Albany County Land Bank. And once the list comes up, you can then download it as a spreadsheet or even as mailing labels. The "abutters" feature looks potentially useful (it's under the tab that looks like three people on the right). It allows you to select a property, look up properties within some distance of that parcel, and then download the info tax ID and mailing address info for those properties. That function will probably be of primary use for the city in sending out notices for various planning review items. But it also looks like it could be a way to reach out to neighbors if you're looking to organize something in your neighborhood -- example: looking up everyone who lives within 500 feet of a park. Sheehan said Tuesday the ultimate goal is to make more information available via Search Albany, including records such as code enforcement actions and property tax status. (Albany already makes some of this sort of info available through the Open Albany public data portal.) And that could be potentially useful for people looking to better understand what's up in their neighborhood. It might also take some time. Chris Spencer talked about some of the challenges in pulling all these bits together for Search Albany, an effort headed by planner Mary Millus. Adding new data can be a long process of figuring out how to access the data, clean it up, format it, and then make it work with the new system. That all times time and effort. Providing a way to look all this sort of stuff parcel by parcel is good. But if you look a little farther out into the future, there might be possibilities for merging all this info in ways that give us a better sense of what's happening in the city. For example: The relative health of neighborhoods is a frequent point of discussion. And that discussion often ends up with people asserting that a neighborhood is heading in a certain direction because of feel or perception or personal experience. And that's OK -- those can be valuable perspectives. But it would also be helpful to be able to add something more specific to those sorts of discussions -- say, trends in home values, or crime reports, or code violations, recycling participation, or whatever. These sorts of metrics -- or even metrics created by blending them together -- won't be a definitive answer. Any sort of stat or algorithm should be taken with a grain of salt. But having those sorts of numbers -- especially ones that can be compared across different neighborhoods -- could be very helpful in getting a better sense of how things are going.